Maybe you noticed that we missed a Crew Member Wednesday this week, in stead we have a Crew Member Saturday today. Karin is sharing some lovely tags using a lot of color and a variety of stamps and art printing plates. 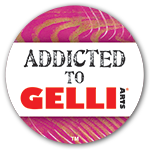 Check out the short video to see how she build these up using gelli prints and cut out images. I love all the layers! Hi there! It's Crew Member Wednesday again and today we have Karen who is sharing an awesome way of creating your own collage papers. Whenever you want to keep it easy but want to do something creative this is the perfect thing to do!! Hi again everyone! It’s Karen here again for another Crew Member Wednesday post for Birgit! I don’t know about you but there are so many times when I want to sit down and create but I just don’t know what to make. This could be because I am simply out of ideas or my brain is just too tired! When this happens I love to sit down and make some collage background sheets for myself, they’re a lot of fun. I simply pull out scraps of printed papers, tissue papers and whatever debris is lying around on my desk and get gluing. You don’t need to pay too much attention to what goes where because you will be cutting the whole thing up to use in pieces and backgrounds anyway! I just copy the finished result on my color printer and then get ripping and sticking into my journal. The pages make great starting points for your journals. I’ve made a video which is a pretty easy one to follow so grab your scraps and a glass of something nice and make along with me.